Dr. Reed understands the concept of hard to fit contact lenses. Dr. Reed has a corneal topographer to evaluate the corneal shape looking for any irregularities or complications to fitting contact lenses. A thorough eye examination is performed to determine your suitability for contact lenses. All contact lens fittings include a comprehensive examination, corneal topography, the lenses, care kit, instructions for wearing schedule and cleaning, and unlimited follow up visits for three months. Acuve, Vistakon, Bausch & Lomb, Cooper Vision, Ciba Vision, Biocurve, Alcon, Hydrogel, Boston, Synergeyes, Paragon, Fluorperm, Menicon and many others. There are many varieties of contact lenses for nearsightedness and farsightedness including lenses you wear for only one day to those you wear for an entire year. They come in soft or hard and some come in a multitude of colors. Most of these lenses are available in stock for you to leave our office with on the day of your visit. We fit contact lenses for people with all types of astigmatism, from minimal to very severe. These lenses are available in hard, gas permeable, and soft designs. 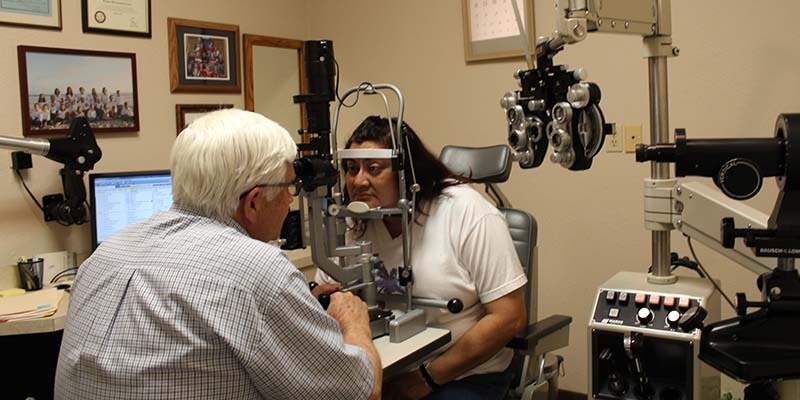 The soft lens designs are available in disposable or conventional wear schedules. One of the newest advances in contact lenses is the introduction of disposable multifocal lenses. We carry Acuvue Oasys for presbyopia, Air Optix multifocal, Pure Vision multifocals and many more. This new technology has made bifocal lenses more affordable for everyone. We also can fit gas permeable contacts for those needing bifocal correction. Most contact lens designs are now available in a wide variety of colors. We even offer the “Wild Eye” collection. These lenses can change your image completely. If you already wear contact lenses and need to update your prescription, Dr. Reed will want to have your previous prescription transferred to his office and to schedule a routine comprehensive eye exam. The fees associated with this are minimal when compared to a new patient with no previous contact lens experience. The various contact lens options have advantages and disadvantages that are all evaluated during the contact lens evaluations to find the best fit for each patient’s needs.